Posted on October 22, 2016 by thelostlighthouse	in Literature and tagged books, D&D, DnD, Dragons, Drizzt Do'Urden, Dungeons & Dragons, fantasy, fantasy books, fiction, Forgetten Realms, gaming, Homecoming Trilogy, Literature, R.A. Salvatore, reading, The Lost Lighthouse, TLL. Our pal (and Total Reroll DM) Ian likes books. Here is what he thinks of some of them. Over 10,000,000 copies sold. Think about that. New York Time’s bestselling author R.A. Salvatore is one of the most successful writers of fantasy to have ever lived. 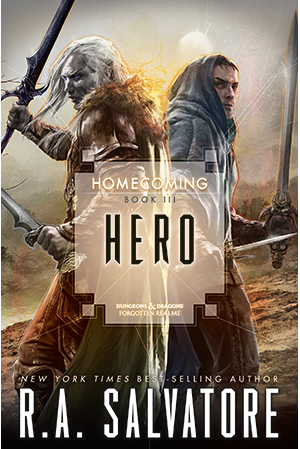 On October 25th his latest novel Hero will be released, book three of the Homecoming trilogy following his iconic character Drizzt Do’Urden, the stoic dark elf with a heart of gold that has spawned countless imitations both in print and in game. He has written over 70 novels in a thirty year career, starting with The Crystal Shard in 1988, and in this time has also managed to write comics, graphic novels, computer games, movies, TV episodes…I don’t have time to list all of it. Luckily he has an astoundingly comprehensive website (http://www.rasalvatore.com/) detailing everything he has turned his talents to. The publication of Hero, which will star the iconic Drizzt, seems a good point to have a look at what makes Salvatore so continually appealing. I’ve read dozens of his books- at least forty are set in the Forgotten Realms, the universe where the Dungeons & Dragons games are set. Salvatore famously received death threats after writing Vector Prime, a Star Wars novel in the old expanded universe (now non-canonical after Disney’s Star Wars acquisition) which killed off fan-favourite Chewbacca by smashing a moon on him. It’s a good book. What am I trying to say here? There is a reason Salvatore is as enduringly successful as he is, and it’s a combination of character, pacing, action, and humour. Even with so many long-running series in his hands, his understanding of character motivation (even in the most fantastical settings) allows the reader to empathise with the most unlikely of individuals. Combined with this is a fantastic sense of pace and dense action (maybe after reading a few of these books in a row the fight scenes start to blur), Salvatore’s cinematic descriptions and endlessly varied and complex action scenes often combined with sincere moments of character development serve to drive narrative constantly forward. Salvatore has described himself as a writer of ‘buddy fantasy’, with unlikely pairings and teams of characters facing adventure and threat with humour and wit. What is wonderful is that this humour, though ever present, knows when to take a backseat to plot or action or emotion, and is in itself varied in its delivery to perfectly suit the character in question- the sardonically dry wit of assassin Artemis Enteri compared to the bumbling physical comedy of dwarf druid Pikel Bouldershoulder, for example. I love R. A. Salvatore’s work. It is consistently enthralling, escapist whilst full of relatable characters, fantastical but compellingly real in all the most compelling ways. If you haven’t read any Salvatore, it can be daunting. For a fantasy fan I’d recommend Homeland, but have a look on his website, read some excerpts, and see what strikes your fancy.